The Duke of Beaufort's Hunt. Silk top hats are still worn by some hunt subscribers, who traditionally wear blue coats with buff facings, and are known as the Blue and Buff. This fashion can be traced back to the family's Plantaganet forebear John of Gaunt, Duke of Lancaster, whose colours were azure and gold. 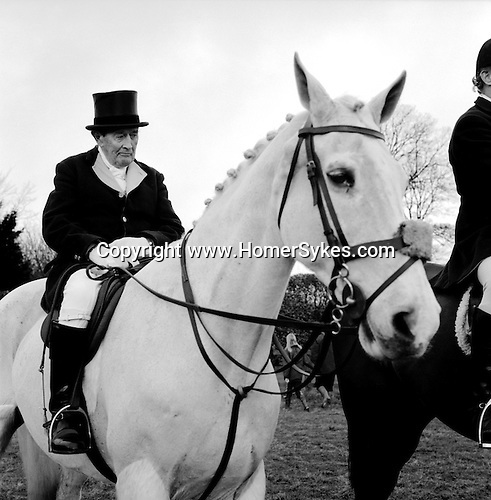 The Boxing Day Meet at Worcester Lodge near Didmarton, Gloucestershire 2002...Hunting with Hounds / Mansion Editions (isbn 0-9542233-1-4) copyright Homer Sykes. +44 (0) 20-8542-7083. < www.mansioneditions.com >..